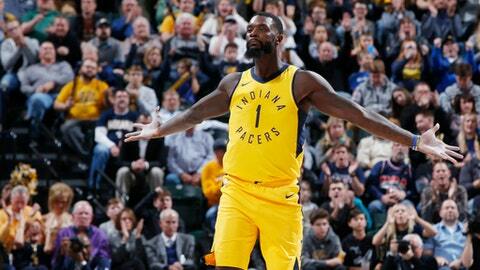 INDIANAPOLIS (AP) When Victor Oladipo went out, Lance Stephenson stepped up. Stephenson scored 13 of his 18 points in the fourth quarter to help the Indiana Pacers win their fifth straight, 107-104 over the Toronto Raptors on Friday night. Stephenson played sparingly throughout the first three quarters, but was extremely efficient, shooting 7 for 9 from the field, including 4 for 4 from 3-point range. He hit back-to-back 3-pointers to give Indiana a 103-92 lead with 4:06 remaining. Indiana outscored the Raptors 31-20 in the third quarter to take a one-point lead, and Stephenson took over from there. He connected on six of his final seven field goal attempts, including the back-to-back 3-pointers, which electrified the home crowd and gave Indiana its largest lead of the half. Kyle Lowry scored 12 of his 24 points in the second quarter as Toronto outscored Indiana 35-21, giving the Raptors a 60-50 halftime lead. Toronto coach Dwane Casey criticized the Raptors’ slow start to the second half, which has plagued the team in recent weeks. Toronto had a chance to tie after Myles Turner missed the second of two free throw attempts with six seconds remaining, but Fred VanVleet’s 3-pointer at the buzzer clanked off the backboard. Turner finished seven points and a team-best 10 rebounds, and VanVleet had a career-high 16 points to go with five rebounds and four assists in 29 minutes off the bench. Indiana opened the game shooting 9 for 13 from the field, including 5 for 8 from 3-point range, but a string of turnovers and poor transition defense allowed Toronto to close the quarter on an 11-2 run. Bojan Bogdonavic added 19 points for Indiana, which had six players reach double figures. Pacers: Indiana entered the game leading the NBA in 3-point percentage, shooting 40.4 percent from behind the arc. … Domantis Sobonis added 13 points and six rebounds despite a poor shooting night. Sabonis shot just 2 for 10 from the field, but was 9 for 12 from the free throw line. … Indiana improved to 9-2 when making at least 10 3-pointers. The Pacers were 11 for 26 behind the arc. Raptors: Close out a three-game road trip at Atlanta on Saturday. Pacers: Host Boston on Saturday.